In the play “Finding the Light, Lisa Hayes portrays Marissa Roth, sharing stories of the courage and resilience of ordinary women surviving extraordinary challenges. The next performance will be in Gaithersburg, MD at the Arts Barn on October 22nd, 2015, from 1 – 3 pm. $20. Following Gaithersburg, the play will show in New York City at the United Solo Theater Festival on November 1, 2015. Tickets for this 6 pm show are $20.50, including fees. 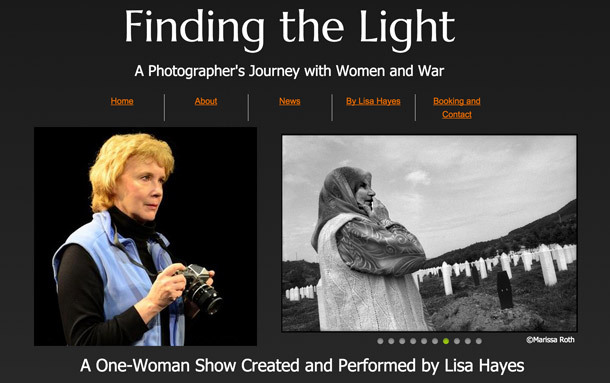 “Written and performed by Lisa Hayes, Finding the Light is a one-hour solo performance that follows Pulitzer Prize-winning photographer Marissa Roth’s personal and professional journey with the story of women and war. Using photographs from Roth’s exhibit “One Person Crying: Women and War,” Hayes portrays Roth, sharing the stories behind the photos of women from Cambodia, Vietnam, Bosnia, Albania, Germany, Afghanistan, and America. Read more on the “Finding the Light” website.